Suncourt Flush Fit Register Booster properly controls temperatures in rooms that are normally too hot or too cold. Increase register airflow with this affordable register booster. Fits a 4x10 floor register (hole opening in the floor). If you have a larger size register, you can purchase an adaptor plate to use on floor/wall openings of 4x12, 6x10 and 6x12. The quiet 3-speed fans pull extra air out of weak registers. Available in pearl and brown. Important Note: Never expose the Suncourt register booster to temperatures over 140 degrees. 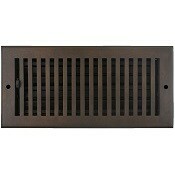 **Adaptor Plate available for separate purchase to use with floor / wall opening sizes (in inches) 4 x 12, 6 x 10 and 6 x 12. 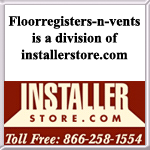 Important Information - Please read this PDF with product information and installation instructions for the Suncourt floor register booster before purchasing. Have a 4 x 12, 6 x 10 or 6 x 12 floor/wall opening? Purchase the Suncourt Adaptor Plate and use it in conjunction with this Flush Fit register booster.